As conveyance for essential truths, gripes about daily life and assorted cosmic vexations, the blues is a singularity of art: Its elements are unendingly simple, universal enough to be used by anyone yet tricky enough to take a lifetime to master. In most basic form, it’s three chords splayed across twelve measures supporting some sort of repeating melodic phrase. There aren’t too many rules in the blues – indeed, many great blues songs don’t use those three chords, don’t fit into 12-measure form and don’t have a repeating melody. The blank-slate nature of the blues makes it less a style or a genre of music than a platform for all kinds of human expression. From an origination standpoint, there is no such thing as “pure” blues: Almost as soon as the blues spread, there were classical composers and jazz players and others seizing its tones to incorporate them into their own works. Of course blues icons like Muddy Waters and Howlin’ Wolf deserve respect as “founding fathers” and shapers of the sound; that doesn’t mean when a singer/songwriter like Tracy Chapman ventures into the blues space, as she did on “Give Me One Reason,” she is somehow less qualified to communicate within it. Likewise Hank Williams. Or Miles Davis. Or Cee-lo Green. The blues is an open tributary, freely shared and happily re-routed. It’s one reason so much American music feels interconnected. Shape-shifting is crucial to the story of the blues, a factor in its long history and a reason it remains such a vital, animating force. The building blocks of blues have been seized and jumbled and endlessly re-routed, detoured into any and every stylistic gulch. 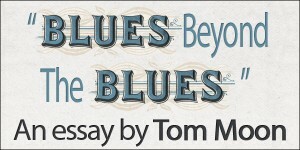 The blues is the backbone of rock and roll – and equally central to the evolution of jazz and country and gospel music. Since the blues began, musicians have been breaking off little bits of it – those flatted-third “blue” notes or the calls that resemble field hollering – and utilizing them in highly individual ways. And somehow, even when the sounds are light years from the Mississippi Delta, a bit of the source code, the trace halo of bluesness, survives. The blues is fundamental expression, shorthand for rivers of sorrow, the musical equivalent of hefty novels that chronicle one trial and tribulation after another. It’s the sound of the human spirit in motion, overcoming or transcending adversity. When a singer wants to be believed, he or she leans into a “blue” note, and just like that, some emotional information beyond words is conveyed. Intellectual property theft is not a small thing, but in a way, it’s less interesting than the cycle of life that’s embodied in the repurposing and re-imagining of the blues. The form itself belongs to everybody, and the members of Led Zeppelin and other British rockers were drawn to it as a creative platform, for exactly the same reasons Charles Mingus and the jazz people were: It could be reconfigured on the fly, in mid-chorus. Searching for platforms that would spark open-ended exploration, they’d start with an enduring melody from the Delta, then stretch it and rejigger it until it erupted as something else – heavy metal thunder, or rockabilly, or a high-lonesome train song. The blues accommodates radical overhauls and tiny incremental changes: You can keep the 12-bar form and lose the chordal code, keep the chords and lose the form, or do like Creedence Clearwater Revival did with “Born on the Bayou” and lose everything except the mythology and the murk. Still works. When you take apart the blues, it’s easy to focus on its significant tipping points, like the river-aided migration from the Mississippi Delta to Chicago, and the parallel evolution of rural blues into its more electrified urban form. There are rich stories there, to be sure, but way before that, from the very beginning of the blues, there’s been wave after wave of what might be called “blues beyond the blues.” The first: Gospel music. Thomas Dorsey, the most prolific composer of gospel, began his career as Georgia Tom, a blues pianist, and traces of that language light up the corners of his compositions. Including the stately “Peace In the Valley,” which is not based on blues form but when sung by someone like Little Richard overflows with blues feeling. The jazz guys twisted the blues into vehicles for their own brand of daring: The brisk bebop classic “Blues For Alice” fits the 12-bar form, but it’s built on Charlie Parker’s ingenious harmonic invention, a fugue-like chordal overlay. Many prominent classical composers of the early 20th century – Claude Debussy, Maurice Ravel, Aaron Copland, Erik Satie – all copped bits of blue moans and melodies to create earthy, quintessentially American atmospheres. And George Gershwin, the songwriter-turned-composer, followed his acclaimed Rhapsody in Blue with a more conventionally organized classical piece for piano and orchestra, Concerto in F. It’s notable for the way some piano passages evoke the fleet-fingered fantasias of boogie-woogie and stride. Gershwin later distilled the blues down to an intervallic essence with “My Man’s Gone Now,” one of the ballad’s from his opera Porgy & Bess. The mournful melody travels up a minor third, then immediately back down. The piece is used in conservatory ear-training classes to teach musicians to “hear” the minor-third blue interval. Of all American composers, Duke Ellington probably did more to infuse blues feeling into songs that exhibit little resemblance, in terms of nuts and bolts, to the blues. With characteristic modesty, he once described his writing this way: “I merely took the energy it takes to pout and wrote some blues.” He also wrote the breathtaking ballad “Sophisticated Lady,” which turns on one skillfully placed blue note. With it, Ellington offers a fleeting hint of blues feeling and then slyly sends it upscale, into a more elegant neighborhood. Lots of his songs, even ones organized around commonplace blues riffs like “Don’t Get Around Much Anymore,” do that. Ellington showed that the blues could be a color or a flavor in the midst of a tune, that blue feeling could be conveyed regardless of structure. That idea recurs throughout Amercian music – in the searching vocal shouts of Jimi Hendrix, the doleful originals of Nina Simone, in the jumping jive of Louis Jordan, the coarse confessionals of Janis Joplin. Though she recorded her share of blues tunes, Joplin didn’t need blues form to convey that anguish: She treats “Piece of My Heart” as blues testimony. You can tell she’s heard Howlin’ Wolf and Bobby “Blue” Bland – and also that she’s got her own way of telling that familiar story of betrayal. Of the rock acts who conveyed blues feeling while sometimes avoiding blues form, the Allman Brothers Band is arguably the most inventive. The Georgia-based group was built around the slide guitar of Duane Allman, a tearful and instantly evocative sound that became more emphatic when placed near a standard rhythm guitar and a firebreathing rhythm section. While totally at home slinging stock blues (“Statesboro Blues”), the band favored originals that borrowed bits from the blues trickbag but were structurally distinct. Among the best: Keyboardist Gregg Allman’s “Whipping Post.” The words express classic blues bitterness and victimhood – “sometimes I feel like I’ve been tied to the whipping post” – within a roaring rock context in which the various guitarists trade lead and accompaniment roles, blues-revue style. Tom Moon contributes to NPR’s All Things Considered. He’s the author of the New York Times bestseller 1000 Recordings To Hear Before You Die.